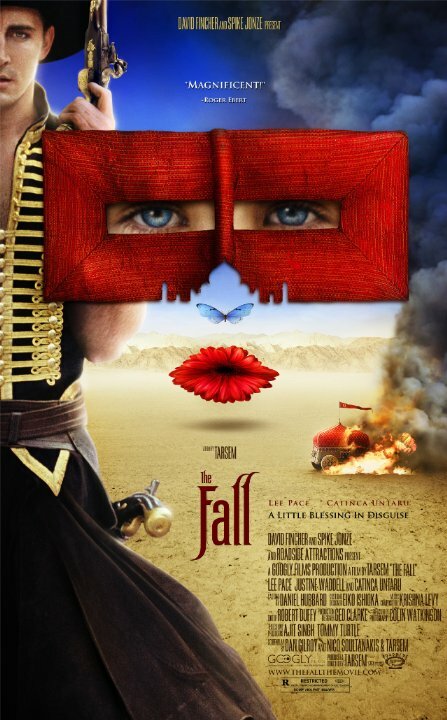 Tarsem Singh’s The Fall fucked me up for days on end. There is no sugar-coating. It left me battered and near tears by the end of it. 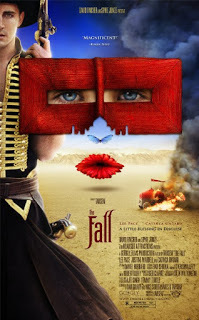 It’s both spiritual and achingly human, imaginative to great heights and yet earthly, a film that’s willing to get down on the ground and cry with its characters. It doesn’t help that its lead character, paralyzed stuntman Roy, is portrayed by Lee Pace, who I’d rank as one of the top actors in my generation. Nevermind that Alexandria is played by the cute-as-a-button Catinca Untaru, making the character impossible to dislike with her sweet voice and bang-on appropriate acting. This film is endearing to me in the way that it speaks to how we compartmentalize the different pieces of ourselves, as well as what aspects of us die first in a crisis, and how we manage to carry on living despite the shattering of our hearts and souls. Nothing but love for this film. To understand this, we have to take a look at the six characters going on the quest to destroy Governor Odious (Daniel Caltagirone), the alter ego of Sinclair from the studio, whom Roy holds responsible for stealing his love interest and, to a certain extent, causing the accident which left him paralyzed. Each character in Roy’s story is a translation of an aspect of Roy that feels the need to avenge for the loss his accident has caused him. Black Bandit – separated from his murdered brother, the Black Bandit vows, “I will annihilate him and everything he loves. I will destroy him!” This character speaks to Roy’s sense of grief, stating at one point, “That which has been taken from me can never be replaced.” In essence, this is the part of Roy that wants retribution for the loss of his ability to walk. This aspect is the leader of the revenge plot, the driving force of the action. 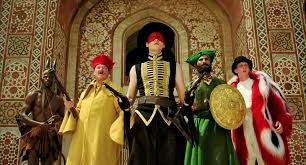 The Silent Indian Warrior (Jeetu Verma) – married to a beautiful woman who had been kidnapped by Governor Odious, he swore revenge when she killed herself in captive despair. The Silent Indian Warrior did not want anyone to see how beautiful his wife was, so she was kept in seclusion. This piece of Roy doesn’t want others to take what he feels is romantically his. Otta Benga (Marcus Wesley) – a former slave who freed slaves and burned fields after his brother died while they were both in slavery. This is the part of Roy that breaks away from the injustice and fights back on behalf of those without a voice, or against those who cannot see the truth for what it is. Luigi (Robin Smith) – an explosives expert who is socially ostracized by Governor Odious. As such, Luigi uses his skills to remove obstacles when they arise. This piece of Roy is covers his extreme social isolation and bottled-up anger. Charles Darwin (Leo Bill) – a scientist looking for a specific butterfly, of which Odious sent a dead one. Accompanied by his monkey Wallace, Darwin is looking for the rare beauty that must be appreciated. This is Roy’s sense of chivalry and natural order of life, which feels wronged because has been violated. Mystic (Julian Bleach) – a man that springs forth from a lone, burning tree to avenge his fallen people. He is part of a community that is always with him. This is Roy’s sense of wonder and belonging. Each represents something that Roy feels has been stolen from him in his paralysis. As such, when he chooses to give up, the order and method of death of each piece of his psyche comes to represent the things he feels he cannnot continue to carry. Darwin dies first, acknowledging the natural order of life and death while willingly joining Wallace, who was chasing something rare and borderline impossible. Next comes Luigi, who limps and skips to attract a crowd. Luigi says before his suicide, “He gave up. It’s not very satisfying, is it? He didn’t think so either.” While his sense of isolation dies, he acknowledges that giving up is not the best way to go for the fulfillment of the soul. Next up is Otta Benga, who is shot by arrows while the group is trying to escape. That the sense of justice dies alongside the Mystic, who is flogged and releases the birds contained within his belly, is significant: he lets go of both his sense of relentless, idealized revenge alongside the part of him that simply knows which way to go. It is the surrender to the unknown, with a sense of calm. The Silent Indian dies next, choosing to give Black Bandit and his daughter a chance to survive in his death. It’s not surprisingly that this portion of Roy has to die: it’s what wanted to keep the object of his affection all to himself. Why did these characters have to die, as poor little Alexandria beseeches and sobs in her bed? The truth is that they didn’t have to die because of Roy’s depression and hopelessness; rather, they needed to die in order for Roy to truly let go of the hurt he carried. Governor Odious tells the child in the story, “Look at him. He’s pathetic…. He’s a drug addict. A useless, good-for-nothing.” This is how Roy sees himself, and he’s just as harsh in the waking world, telling the little girl, “There’s no happy ending with me…. He’s a fake. He’s a liar and a coward… There’s nothing left for him.” And so he goes about systematically killing those that represented the fragmented pieces of his psyche, leaving the core self: the truths he does not want to face, and the low opinion of himself. This is meant to be rock-bottom for him, as he’s alone with the worst version of himself. It’s the pleading of Alexandria that winds up saving the life of the Black Bandit in the story: “Let him live.” Ironically enough, it’s the deaths of the supporting characters of the story that give Roy the strength to let his Black Bandit live, for these are the pieces that represent the pain that made him want to die. In letting go of the hurting pieces of himself, he’s able to release his sense of lost love via Sister Evelyn (Justine Waddell), who is in turn a surrogate for the real heartbreaker in his life. While a suicide mission for the other characters, the act of character murder purges him of the pain he carries. It’s ultimately a statement on the need for letting go of what ails you. Sometimes, you need to let go and embrace what’s around you, even if it’s not perfect. After receiving the stolen eucharist from Alexandria, Roy asks her, “Are you trying to save my soul?” What Roy does not realize is the fact that he saves his own soul through the murder of the other characters. Alexandria may not immediately recognize it, but it needs to happen. The compartmentalized pieces of self need to die in order to forge the peaceful man that sits beside her while watching a movie. He had to sacrifice closely-held masks in order to find who he was, which gave him the ability to live rather than survive. Alexandria tells us that she saw him in a film years later, letting the audience know that Roy made full recovery. This isn’t just Roy’s recovery; it’s our own. By Roy’s painful leadership, we’re able to see that the baggage we carry doesn’t need to be carried. Sometimes, you need to give up the hurt and move on.